In this article, we are recommending the Compass Diversified Holdings, 7.25% Series A Non-Cumulative Preferred Shares ('CODI.PA') or CODI-A, which currently yields 9.4%. This preferred stock provides investors with a high and juicy dividend that's well covered and that's also backed by a company that is battle tested. We have made our thesis in a recent article published on Seeking Alpha explaining why we believe that further interest rate hikes by the Fed are nearly done, and why we believe that interest rates are set to decline in 2020 and beyond. We strongly believe that income investors should be buying high-yielding stocks, including preferred stocks today in order to lock in the high yield. For conservative income investors and retirees, the preferred stock space is one of the most defensive and conservative ways to get exposure to high-yield stocks. The price of preferred stocks is inversely related to interest rates, therefore once interest rates start to decline, the price of preferred shares is set to soar, and the yields we are seeing today are unlikely to last. This is why we have been dedicating a series of articles to uncover the best high-yield preferred stocks that still trade at attractive valuations. As for the CODI-A preferred stock, this is a unique buying opportunity offered by the markets today, and I will explain why I have added it to my retirement account. The issuing company of the preferred stock CODI-A is Compass Diversified Holdings (CODI), a publicly traded "private equity" firm that acquires and operates middle market businesses in North America. The company is externally managed by Compass Group Management LLC which has been successfully acquiring and managing middle market companies for more than 30 years. This is a battle-tested company that has gone through the great financial crisis of 2007-2008 and managed to outperform the S&P 500 index during the period (including the great bear market related to the financial crisis). Below is the chart comparing the "total returns" of Compass vs. the S&P 500 index since the year 2006. Note that Compass did not cut or reduce the dividends to common shareholders during or after the financial crisis. Now that's pretty remarkable. The stock currently pays a very generous yield of 10%. The company was established as a publicly traded partnership to avoid paying taxes at the corporate level, and as such, investors receive K-1 tax forms. If for some reason the company is restructured as a C-Corp in the future, this will invoke some redemption provisions for its preferred shareholders. Compass currently owns 10 companies which comprise the asset base and cash flow generation of the company. Its primary source of income is interest and principal payments on loans it has extended to its platform companies. Compass has direct access to the cash flow of the underlying platform companies (they are subsidiaries) and uses this to service its own debt and dividends. What's important to note is that Compass is highly diversified into leading brands and growing businesses, producing consistent cash flow and earnings growth. Five of these businesses are consumer businesses and the other five are industrial businesses. 5.11 Corp. is a provider of tactical apparel and gear for first responders and military special operations as well as for outdoor and adventure enthusiasts. It was acquired for $408 million in 2016. Velocity Outdoor Corp. is a designer, manufacturer, and marketer of air-guns, archery products, laser aiming devices, and related accessories. It was acquired for $150 million in 2017. Compass changed the name from Crosman when it added acquisition Ravin to it this year. Ergobaby Carrier, Inc. provides a broad range of baby care products including carriers, strollers, car seats, swaddlers, nursing pillows. It was acquired for $85 million in 2010. Liberty Safe and Security Products, Inc. is a designer, manufacturer, and marketer of premium home, office and gun safes. It was acquired for $70 million in 2010. Manitoba Harvest, based in Winnipeg, Manitoba, is a pioneer and leader in the manufacture and distribution of branded, hemp-based foods and ingredients. It was acquired for $103 million in 2015. Compass Advanced Circuits Holdings, Inc. is a provider of small-run, quick-turn, and volume production rigid printed circuit boards, or "PCBs," throughout the United States. PCBs are a vital component of virtually all electronic products. It was acquired for $81 million in 2006. Arnold Magnetics is a global manufacturer of engineered magnetic solutions for a wide range of specialty applications and end markets. Its products include high-performance permanent magnets, precision foil products, and flexible magnets. It was acquired for $129 million in 2012. Clean Earth Holdings, Inc. is a provider of environmental services, acting as a one-stop solution that analyzes, treats, documents, and recycles waste streams generated in multiple end-markets. It was acquired for $251 million in 2014. Sterno Group is a manufacturer and marketer of portable food warming devices and creative table lighting solutions for the food service industry. It also provides flameless candles and outdoor lighting products for consumers. It was acquired for $160 million in 2014. Foam Fabricators is a designer and manufacturer of custom molded protective foam solutions and OEM components made from expanded polymers such as polystyrene and polypropylene. It was acquired in February of 2018 for $247.5 million. Since the IPO in 2006, Compass has purchased 19 companies like this (it calls them platforms). They also purchased 28 of what they call add-ons, which are basically bolt-on acquisitions for the platform companies. It most recently divested Camelbak in 2015. It has realized more than $770 million in gains from divesting nine of the platforms it has purchased. 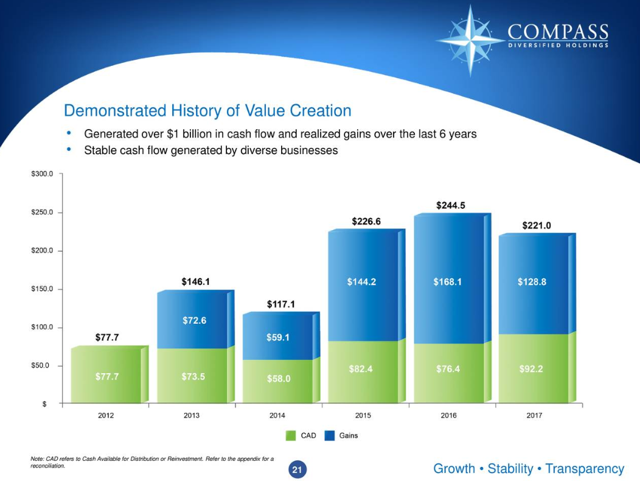 Compass has been a fast-growing company in terms of revenues, EBITDA and earnings. 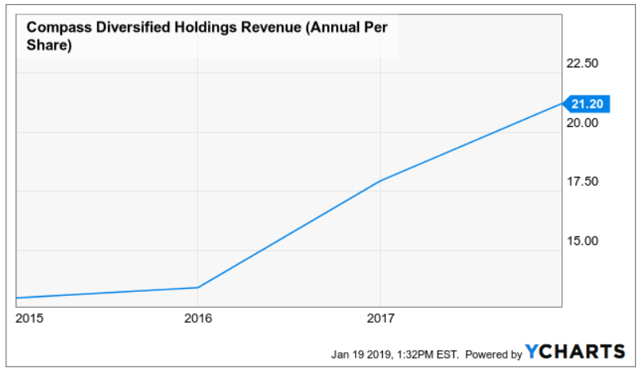 Revenue per share has been increasing fast since 2015, by about 60%. That has certainly helped earnings increase and shows that management has been implementing its strategy effectively. Since 2015, earnings (as measured by EBITDA per share) have also increased at a fast pace by over 60% in the past four years alone. Handling debt well is very important. For companies that are capital intensive, and acquiring middle market companies like CODI does is capital intensive, it's important to borrow enough. But at the same time, borrowing too much can result in debt costs eating all of your cash flow. The current leverage based on the company's latest 10-Q reports was at 3.85 times EBITDA which is reasonable and well below the debt covenants requirement to be below 5.0 times. Total EBITDA for the first nine months of 2018 was reported as $183.4 million, with total interest expense of $35.5 million. Preferred share distributions were $8.4 million for the period. Cash flow available for distribution or reinvestment was $70.7 million (distributions for preferred shares are already subtracted from this number). Distribution for the common units was $64.7 million. Leaving some $6 million after all interest payments, and distribution payments (both common and preferred) were paid. The dividend coverage on the common is at 1.09 times CAD. The dividend coverage for the preferred shares is at 9.4 times CAD. The preferred dividend coverage is enormous. 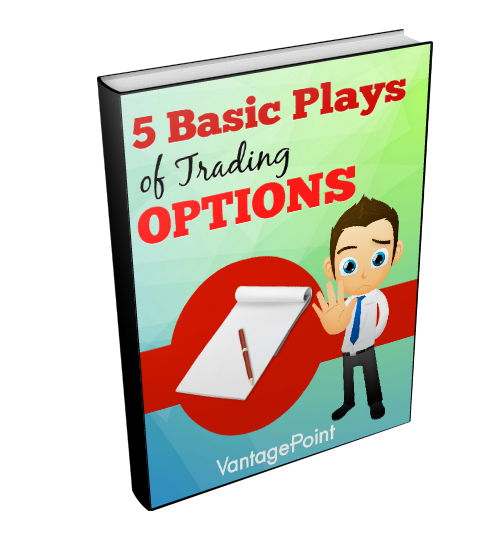 There are two main risks that investors need to be aware of. 1- The External Manager: Compass has external manager with a long track record, but it has been labeled by some analysts as not very much aligned with shareholders. The reason is that the fees of this management are mainly based as a percentage of "assets under management" rather than based on the profitability of the company or on the share price performance. This has resulted in the company growing enormously, but common shareholders did not benefit much because the profits are constantly used to further grow Compass' portfolio. 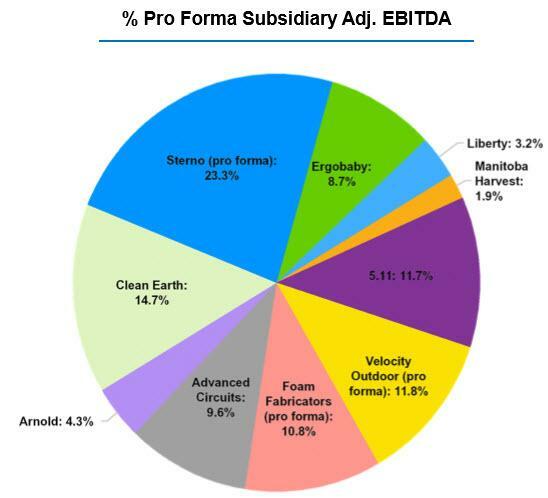 As a result, the dividends have not increased despite fast-growing EBITDA. We agree with this criticism, and we believe that management's compensation should be changed to become based on the performance of the stock price and/or the profitability of the company. 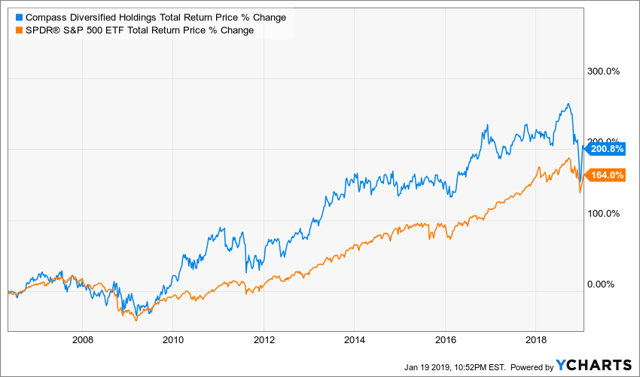 Still, putting things into perspective, the common stock CODI has outperformed the S&P 500 index since the year 2006, and therefore management has done well so far with common shareholders. 2- Recession Risks: While the company is a battle-tested one and did not even reduce the dividends during the great financial crisis, the current dividend coverage for the common shares is not very high, just at 1.09 times. The cash flow, specifically CAD (Cash Available for Distribution) while on an upward trend may not increase in case we hit a recession. This could lead to a situation where Compass doesn't have enough cash flow to meet all of its needs. Furthermore, in addition to the recurrent income from its underlying subsidiaries, Compass generates additional income by buying and selling businesses, and in case of a recession, this line of business could underperform. Given that the dividend coverage on the common shares is not as high as we like to see, there's a risk of a dividend reduction in case of a weakening economy. Purchases and sales of stocks by insiders always are of interest to us, and we monitor this very closely, especially for stocks that we recommend to our investors. Compass insiders have been active in purchasing shares over the last three months. CEO Elias Sabo has made two big purchases, bumping his share count by more than 12% between the two transactions and paying more than the current share price. With these purchases, totaling more than $1 million, Sabo now owns about 585,549 shares (or just under 1% of the outstanding shares). Six directors all purchased more than 7,000 shares at the start of the year in what looks like an attempt to bolster share price with a show of confidence. While these purchases were just under $100K and not a big proportion of total outstanding shares, they do represent a significant increase in share count for five of the seven directors. Sean Day, one of the two where the purchase wasn't a big one, already owns more than 1% of outstanding shares. Large shareholder (owns more than 10% of the shares) Anholt Investments has made multiple purchases of the common and both preferred issues. They purchased more than 48,000 of the Series A preferred share(the one we recommend) and some 68,000 of the common share. Other than the January buy, all these purchases have been at prices at or above the current market price. Given that CODI is externally managed, these insider purchases are very important. By having officers of the outside management company also invested in shares makes them more aligned with the interests of common shareholders. We believe that the common shares of CODI are an attractive investment at the current price, and the yield is very generous at 10%. However, with the possibility that the risks to the U.S and global economies will start to increase in 2020 and beyond, we believe that income investors should be on the defensive. In preparation, we have been recommending to our investors a larger allocation to preferred stocks and bonds to hedge against economic risks and related market volatility. This strategy should pay off well, especially for conservative income investors and retirees, and for those near retirement. With a view that interest rates are likely to start declining in 2020 and beyond, income investors are much better served by investing in fixed-rate preferred shares, rather than a floating (or variable rate). Variable rate preferred stocks were great during time of rising interest rates, however, they are set to underperform, and may take a big hit, when interest rates start declining. This is the reason why we have been advising our investors to reduce exposure to floating rate preferred stocks, and even avoid them altogether. Now is the time to lock in the higher yields of fixed-rate preferred stocks for the long term, and this has been our strategy at High Dividend Opportunities. Therefore, we are recommending to invest in the CODI-A share (or CODI.PA). Due to the recent market correction, the CODI-A Shares are trading at a bargain valuation. Currently, they are trading at only $19.10. Note that the shares have traded above $22.80 a share a few months ago before the recent market correction, or about 20% higher from the current price. This is the kind of unique opportunity we look for our investors. The yield is at 9.4%, very close to the 10% yield offered to the common shareholders with a much higher level of safety! The most recent yield of CODI-A is 9.4%. The dividends are rock solid. 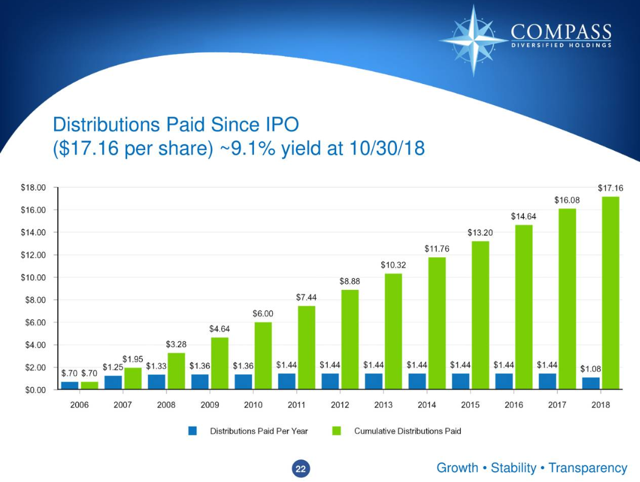 The common shareholders are currently getting a huge 10% dividend yield. In case of trouble, CODI may be forced to cut common dividends. If this happens, CODI will have plenty of cash to pay the preferred shareholders. Remember, this preferred stock has an enormous coverage of 9.4 times. The yearly dividends of $1.8125 are paid on a quarterly basis (consisting of $0.453125 per quarter) on 1/30, 4/30, 7/30 and 10/30. They go ex-dividends on 1/14, 4/14, 7/14 and 10/14 each year. If the shares are called at the end of July in 2022, this amounts to a 14% yield to call. An interesting feature of the Series A preferred is that in a Tax Redemption event or a Fundamental Change event, the redemption price is $25.25(or $0.25 above its par value of $25.00 per share), plus accrued and unpaid dividends. 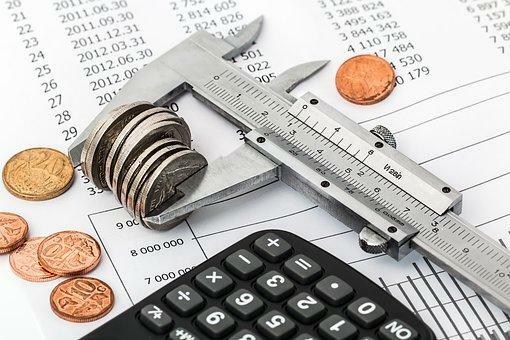 Basically, if the company has its tax treatment changed to that of a C-Corp that qualifies as a Tax Redemption event (for instance say the law on what is required to be considered an MLP changes and Compass no longer qualified), the company is required to redeem the shares at a price of $25.25. Given these provisions, for investors wanting a steady and safe income (such as those in or near retirement), the Series A preferred is a great investment to buy and hold for the long run. Most of the year 2018, CODI-A has been trading around $22.80. Our short-term price target is $22.00 per share, which would represent a capital gain of 15%. Buying CODI-A at any price below $21 is of great value. 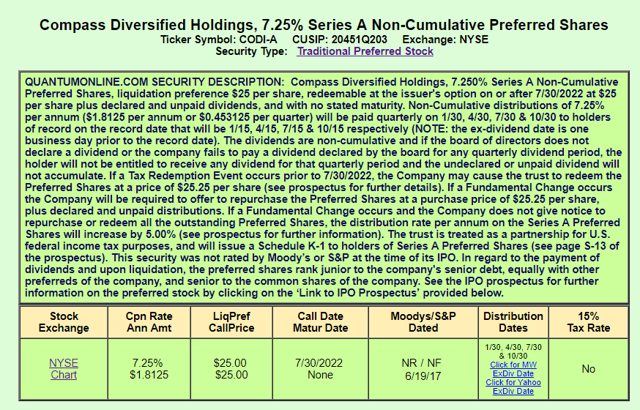 The preferred CODI-A is the best way to get exposure to Compass Diversified Holdings. This is a battle-tested company that has outperformed in good and bad times. CODI-A offers an extremely generous yield of 9.4%, an opportunity that's unlikely to last long. 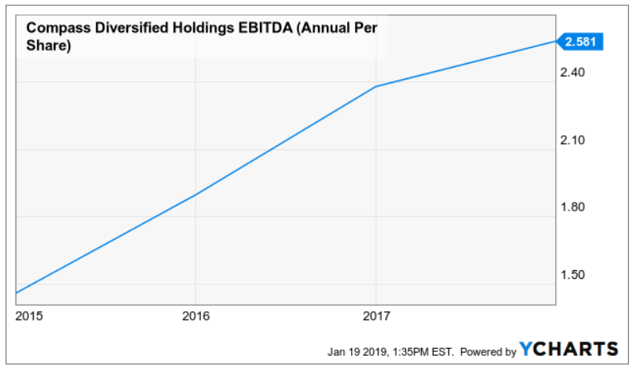 While there are big capital gains to be made, we are buying CODI-A for its juicy dividend and its higher margin of safety as a long-term income investment.